Well friends, we're getting down to the home stretch! I've finally gotten to the point where people say to me, "Oh wow! You're almost there!" And yes, yes we are...and oh boy does it feel good. 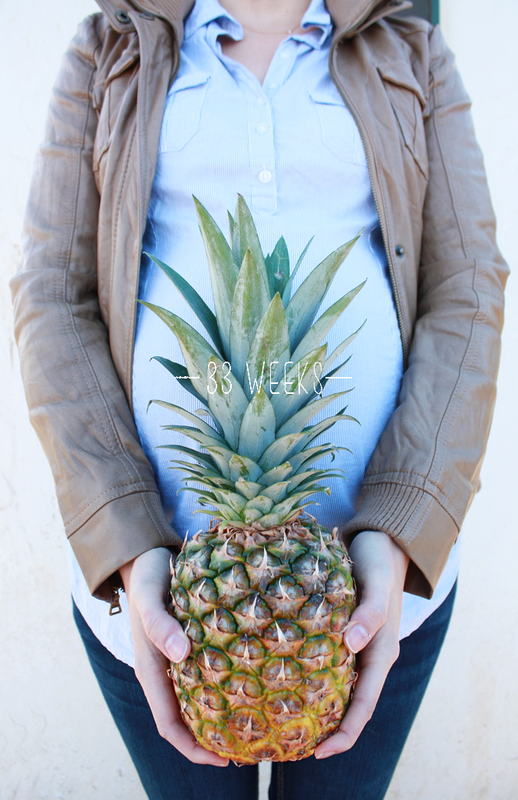 This week Baby Main weighs as much as a pineapple! So he should be weighing at about 4 pounds and measuring at around 17" from head to foot. It's so crazy thinking something that "big" is living in my tummy, moving around and doing baby things! And boy is he moving! He's a very, very active little one- constantly pressing on all my organs and ribs and pushing himself WAY out. Haha. Things have gotten very "alien-like" in my stomach area. We're constantly going, "WOAH!" All the sugar. Which for the weeks between Thanksgiving and Christmas I actually stopped eating and lost some weight!! I was so excited! Then Christmas came...and cookies...and New Years...and more sweets and I swear when I go to the doctor this afternoon she's going to slap me. Water like it's going out of style. I'm all of a sudden SO thirsty. I mean, like...GIVE ME ALL THE WATER RIGHT THIS VERY INSTANT! I'll drink huge swigs and minutes later feel like I haven't had a sip of anything liquid in hours. It's the weirdest thing. I can't get enough hydration right now. Coconut water too. I just tried the little cold pressed bottle in the refrigerator section at Trader Joe's and LOVED IT! So now I need cases of it. 100's of cases. I also bought a HUGE carton of Zico which is already devoured. I can't get enough coconut water. Still reading through my Mayo Guide to a Healthy Pregnancy book. I love that thing. Other than that, I'm really trying not to read too much stuff because it either terrifies me (because everything is now about "preparing for labor") or overwhelms me. Ahem, like last night's reading about perineal massages?!?! UGH. Anyway, Bill and I are definitely feeling educated and ready for little baby to make his debut, I'm at peace about the amount of knowledge we have, so why worry myself? Going to sound like a broken record here, but really, really wanting the round ligament pain, right rib numbness and pain, and back pain to subside. Between those three things I feel like a 100 year old elderly lady egg shaped fatty. You should hear the groans and grunts I make just trying to move a few inches. See above! It's gotten worse over the weeks which really affects both my daily activities and night time sleep. Complain complain. Le sigh. Also praying for Baby Main because we love him so much, his health- that he would remain a healthy little one and move down where he needs to go to prepare for labor, and for just an all around "easy" time when it's TIME! By "easy" I mean, that both Bill and I are mentally, physically and most importantly emotionally prepared. I keep asking Him for peace and grace when that time comes :) I don't want to be a crazy lunatic of a screaming panicking woman, like I fret I might. Thank goodness for the ability to take naps if I need to :) I'm so thankful for them some days! During the night I sleep about a good solid hour at a time, then I wake up to screaming pain somewhere on my body and have to shift positions...and potty. The Lord is so good though- those naps are SUCH a help and there are even some days where I don't need one. Sleep has become this sort of philosophy to me now. It's like...it once was a prized beloved thing and now I'm like, "Eh...sleep. What exactly defines sleep?" Tired and ready. Like, really, really ready. I'm starting to understand what all my friends meant when they told me "The Lord knows just how long to put a baby inside a woman to make her WANT to go through labor!" Yeah... almost there. Almost. It's just the neatest time for Bill and I right now with this little one. He's so active and so big that you can't NOT see him. That's like the NEATEST thing for me- to have Bill see him and feel him without me going, "Did you feel that?!!?!? No???? UGGGGGHHH!" He stretches my tummy WAY out, which we laugh at, punches and kicks Bill in the face when he gets near my tummy and talks to him, goes on crazy rampages where he's kicking and punching up little storms and shaking my tummy like an earthquake and even has shown us knees and elbows running across my skin. It's SO COOL. He even allows others to feel him too- my mom, my sister, my sister in law and my niece have all had the little (or big) kick to show them he's there. Shirt // H&M Maternity. Jacket // Guess. 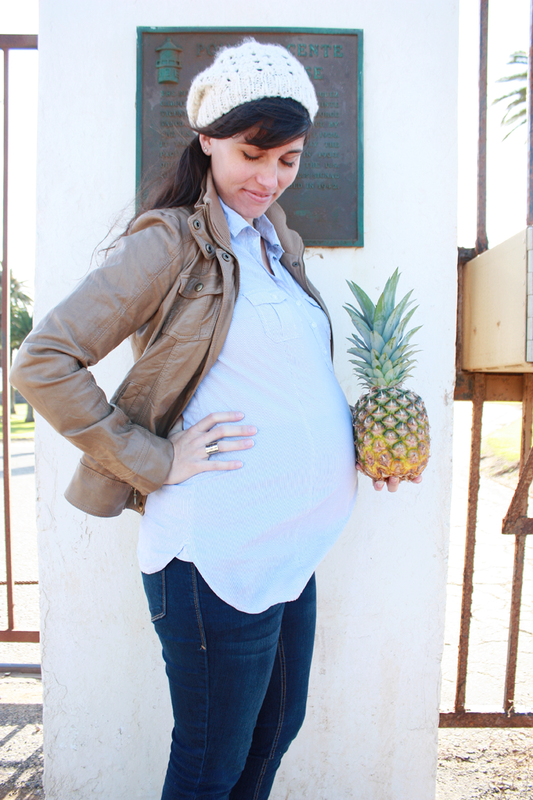 Pants // Old Navy Maternity. Only a few more updates and he'll be here! Holy cow. I'm sooooo excited for you!!! I always thought the first few weeks when you get pregnant and the last weeks before you have the baby are the hardest. The pain, the anticipation, the uncomfortableness... you just want the baby to be here!!! But he will be here before you know it, and then your new life will begin. It's such a crazy adventure! It's the best!! Hang in there mama, and enjoy the naps and the time alone with the hubby. Go out to eat at restaurants just the two of you, or alone too... that is the one thing I miss the most! lol! You are just the cutest, friend! Can't wait for that little babe to enter the world. I know you are so ready to meet him. :) And it is SO crazy how you can see them move. One of my friends just had her baby, but she would send us videos of him doing gymnastics in her tummy. It is a sight to see! I so agree Sabrina! That is right on. For me it was the first 12 weeks and now...well maybe the last 12 weeks! HAHAHA. Totally trying to enjoy all the nappage I can get my hands on and yes, hubby and I are trying our hardest to really absorb these last few precious weeks where it's just the two of us. Miss you friend! I CAN'T WAIT! I think I've dreamt of him 4 or so times in the past 2 weeks! I just can't wait to see him face to face and touch him! Snuggles! Cuddles! Rub downs! All of it. Can't wait.